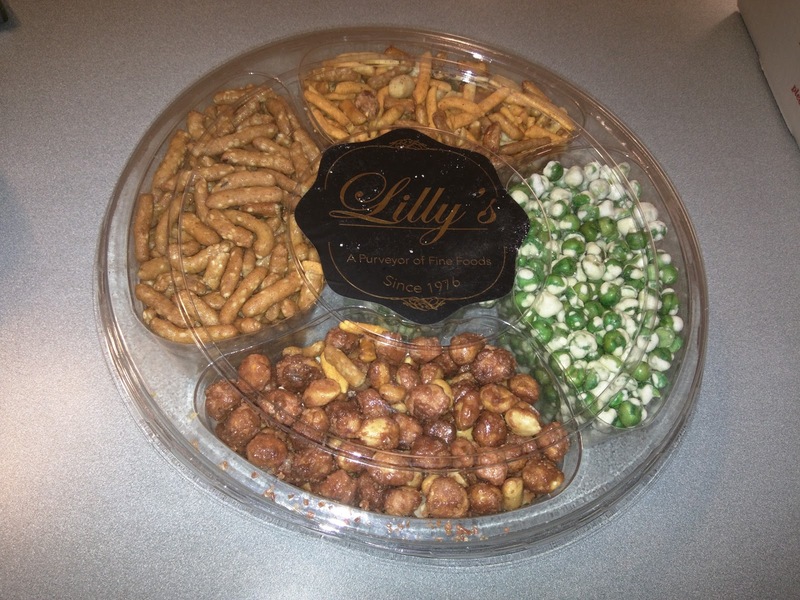 Lilly's Family Foods is a snack food company based in Long Island. They've been in operation since 1976, when they started as a health foods store. They make assorted snacks like dried fruits, nuts, trail mixes, and other snack mixes, generally sold under several different brands: Elizabeth's Naturals, Joseph Xavier Find Foods, Robert's Gourmet Treats, Rita's Pure Earth Organics, and Mary's Snacks To Go! I found their goods in the funniest of places: at BJ's, in my hometown. My mom needed to pick up supplies for a BBQ with the extended family, and wanted to grab a few things from BJ's. She asked if it was ok to stop on our way home from dinner one night since we were nearby. She apologized about dragging me there, promising it would be fast. Little did she realized that BJ's would be a wonderland to me. I haven't been in a place like that in ... years. I was fascinated by nearly everything. I also couldn't believe how inexpensive everything was (particularly compared to San Francisco prices). In the end, she was the one dragging ME out of there. Anyway, at one point, I found the snack foods section, and was overjoyed. I love snack foods. It didn't matter than my mom had tons of homemade treats at the house. Her shopping cart quickly filled with items like veggie chips and other exciting looking nibbles. At one point, I was standing there with like 4 different snack products in my hand trying to decide which one to get, trying to not buy ALL the things, when my dad pointed out a mixed party platter of snacks. I think he was joking, as it was a huge platter, clearly for sharing. Or, for, uh, me. I loved my platter, and promptly told my mom that I have a new request for the agenda whenever I come visit: visit BJ's, and try more snack foods. I've seen returned to try more mixes. Lilly's Family Foods Party Bowl. My party bowl had 4 items in it, each in their own compartment, plus a center compartment filled with extra wasabi peas. It was fairly remarkable that they items didn't spill from one compartment to another, there was only very minimal mixing. The wasabi peas were the style that I don't actually love. They were ... too wasabi for me. As in, too much wasabi coating, too strong. They were fine, but, just not the style I like the best. 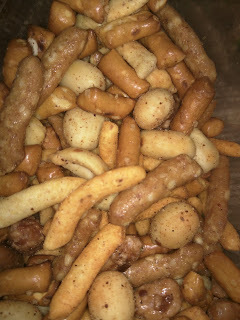 Sweet & Salty Pub Mix. I love snack munchies in general, but, snack mixes are my absolute favorite. I really love picking through snack mix and eating a bunch of one item, then a bunch of another, and another. It makes you wonder why I care that they are all mixed together in the first place, but, well, I do care! This mix had a number of different items: little pretzel rods, cajun sticks in two varieties, flax seed corn chips, peanuts, sweet sesame sticks, and candied nuts. I didn't care for the pretzels, as I never really like pretzels, and the plain peanuts were a bit boring (they did have a bit of cajun spice on them), but, I liked all the other spicy, savory items and the sweets. The cajun stick things were ok, not remarkable. The flax seed corn chips were my favorite, surprisingly, as I don't like flax. They were a good size, and I loved the saltiness. 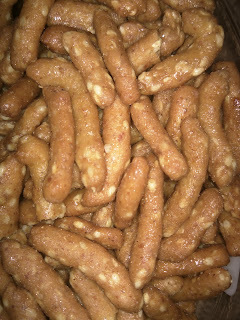 The sweet sesame sticks and the candied nuts were both good, I liked having the sweets mixed in with the salty. I'm not 100% sure these were different from the honey roasted sesame sticks and the butter toffee peanuts included in the other compartments, but, they seemed to be. The peanuts in particular I think were just honey roasted, not butter toffee'd. This was fine, and I enjoyed it, but, I actually like the AA lounge snack mix better. The honey roasted sesame sticks were very solid. They were just standard sesame sticks, although sweeter than many. Good to munch on, nice crunch, lots of sesame flavor. Better than the similar sticks I bought at the fancy grocery store in town earlier in the week. Next time, I'll just get these! 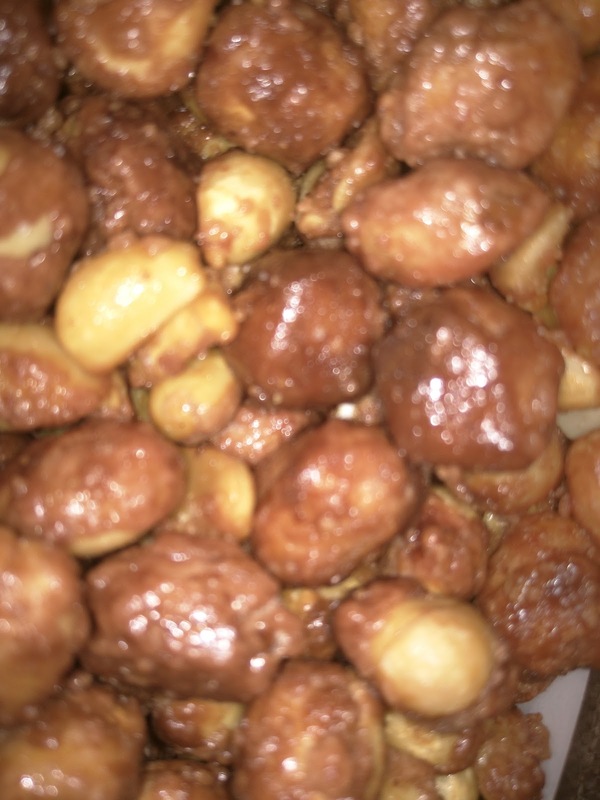 These were just super sweet, glazed, crunchy peanuts. They had so much coating on them, and were well coated. Sure, perhaps they were my favorite because they were the sweetest, but, I loved just munching on them by the handful. They'd also be great chopped up and thrown onto an ice cream sundae. 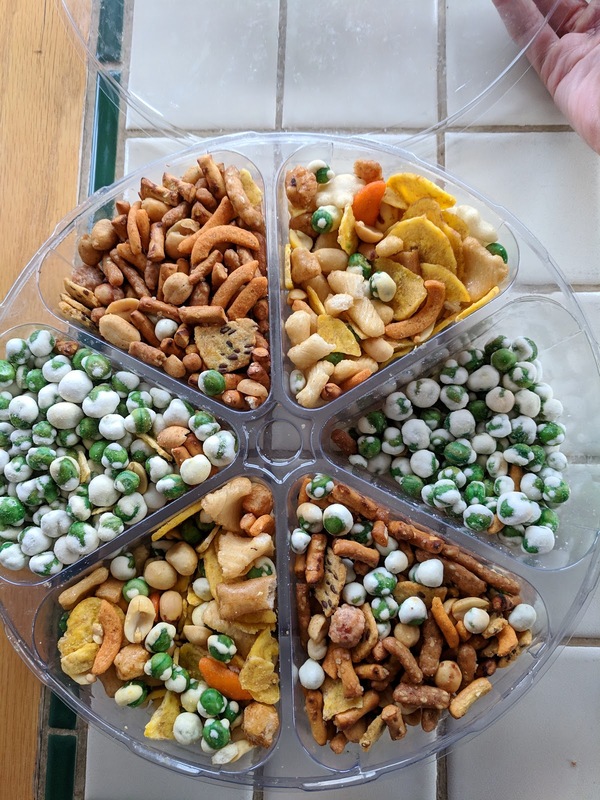 For Christmas one year, my mom already had an assortment waiting for me, another snack platter with multiple compartments, some different from before. Tailgate Mix / Wasabi Peas / Sweet & Salty Pub Mix. This mix contained 6 compartments, all duplicated. The wasabi peas and sweet & salty pub mix I had before, but the "Tailgate Mix" was a new one for me. 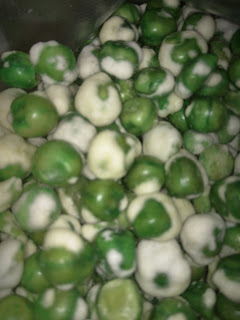 I liked the wasabi peas more than I had previously, although they still aren't quite the style I like. Something about these just doesn't quite do it for me. The wasabi flavor is just ... eh. The Sweet & Salty Pub Mix I also liked less. No element was really that interesting to me. I'm not sure why. I just wasn't into any of it. 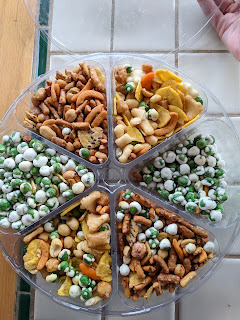 The Tailgate Mix was the new one to me, with wasabi peas (the same as the standalone, so, eh), rice crackers (asian style with slight soy flavor, but, boring), and plantain chips. The plantain chips were fine, starchy, salty, but not notable. Given all the other treats my mom had around the house (like her chex mixes! ), there was no real reason to go for this platter.